The Leo Man in love personality is highly affectionate and sincere by nature. You are exceptionally bighearted and you have no inhibitions in spending money once you like a person. You are always in high spirits and have an optimistic view about life. People with the same positive temperament will be attracted towards you. You want to enjoy life with gusto and have no time for brooding people. With great poise, Leo male has a strong desire for authority and likes to be in the limelight always. Because of your inherent leadership qualities, your guidance will be valuable for people facing challenges in life. Your zeal for life will drive you towards best things in life. You can afford extravagant things in life because you accumulate wealth by your imagination, intellect and diligence. The Leo man in love personality traits show that the Lions are ambitious and determined and will get what they want in life. You are inflexible and dogmatic in your ideas and are not ready to hear the points of view of other people. Opposition to your ideas will be met with fury and intolerance. Your natural ability to be creative will lead you to professions in fine arts and journalism. In matters of love, Leo lover is loving and extremely passionate. When engaged to a new soul mate, you tend to be gallant and generous. The Leo man in love traits show that when you get into a permanent relationship like marriage, you will be caring and faithful to your partner. With children, the Leo father will be exceedingly affectionate. Leo with his love partner present a perfect couple and he is very much traditional in his outlook as far as marriage is concerned. You are particular about celebrating the birthday of your spouse and your marriage anniversary in style replete with lavish gifts and parties to keep your spouse in good humor. Even in bed, the love compatibility between the Leo and his partner will play an important role. Leo Male along with his spouse is a complete entity and wants both of them to be in the center stage always. Things will be hunky dory so long as she does not commit the mistake of overtaking you. If she actually does, that will be end of the road for the partner and a breakup is bound to occur. The Leo man in love characteristics show that it is extremely selfish at times and wants to control the life of his partner. Any danger to your authority or assets will not be tolerated and will be met with all the fury in the world. You will feel threatened if your spouse devotes more attention to your children than yourself. Your spouse might also have no place in your business or profession. When dating, the Leo man expects their lover to appreciate their wit and style. You want your partner to emulate your habits. The Lion does not like to be controlled by his mate and will not tolerate any hints of disloyalty from her. 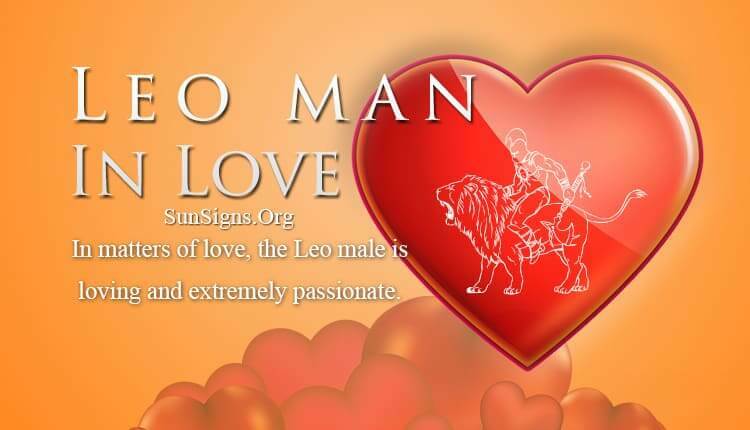 The Leo man in in love personality is comfortable in partnership with Aries, Gemini, Libra and Sagittarius females. Leo male expects his mate to encourage him to achieve his wild dreams which are constantly shifting and discover the beauty of the environment outside. This Leo man in love personality traits show you are so vigorous in the activities of the world outside, that marriage is a safe haven for you to relax. In marriage you look for a peaceful and enjoyable environment which will rejuvenate your overspent energy in your work place. The Leo man in love characteristics show you understand the importance of family relationships and are constantly striving to form a royal unit along with family members. You make special efforts to educate your children and direct their energies for right purpose and the knowledge can be useful for the future generation. You take pride in your achievements in life and you want your family to enjoy the fruits of your success. The Leo man wants to lead the world with very lofty ideas which are far away from reality. Your aim is to force others to respect you for your thoughts and actions. You are undeterred by the criticism of others and go about your life in a regal fashion. The Leo man in love characteristics show that life with this Lion will be exciting and captivating and he will have fresh ideas every moment. You will force others to follow your ideas. Your marital life is full of romance and passion which will remain in the memories of future progeny for a long time.